Schools involved in Universe in the Classroom are being offered a unique and exciting opportunity — to explore the exotic wonders of the Universe from their classrooms using professional telescopes! Las Cumbres Observatory runs a network of powerful robotic telescopes located around the world. 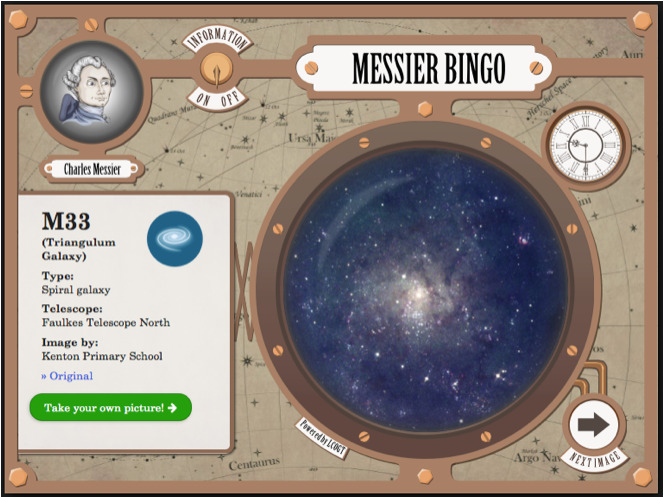 Using the Internet, primary school teachers and students request observations of the hidden gems of the Universe from the telescopes using our specially designed platforms: Messier Bingo and Project Serol. Or use the telescopes asan inspirational hook as part of a hands-on classroom activity by visiting our Support Materials section. 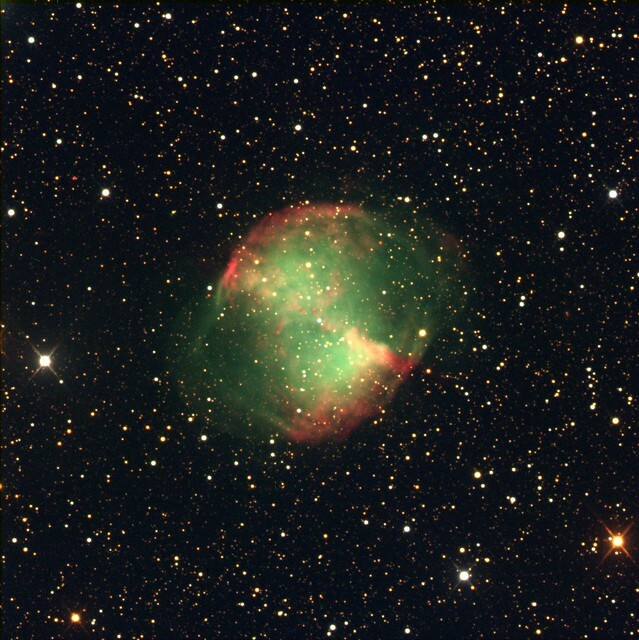 Users don’t need any prior knowledge of telescopes or astronomical objects, we provide everything you need to become an explorer of the skies. A Las Cumbres Observatory 1-metre robotic telescopes in its dome. To make it as easy as possible to carry out an observing session with your class using the robotic telescope, we’ve incorporated the experience into a game of Bingo. It’s fun and easy to play: when you see an object you like, take your own picture with just the click of a button. 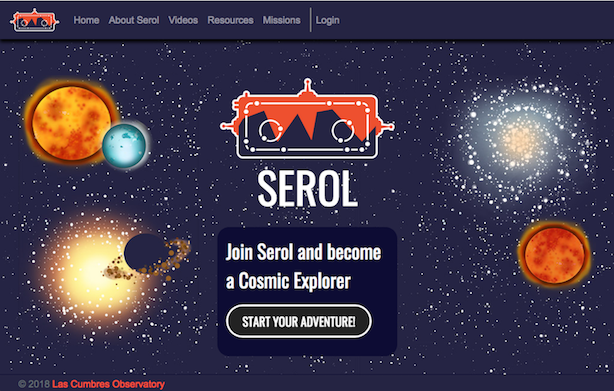 We’ve created a dedicated website called Project Serol that uses robotic telescopes takes students on a journey to become a real cosmic explorer! A core aspect of Universe in the Classroom is to help Welsh students (and their teachers) enjoy and explore the vast Universe using this robotic telescope network. 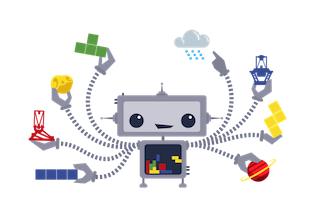 A range of astronomy activities, guides and screencasts have been designed to support use of the robotic telescopes. The robotic telescopes activity book allows students to pursue their own science investigations using professional-quality equipment and cover a range of National Curriculum subjects to help teachers fit the activities and telescopes into their lesson plans. We have created two simple step-by-step guide: the first walks users through their first observing session and the second shows you how to download and add colour to your images. The robot behind Las Cumbres Observatory is called SEROL (“Starry” in Welsh). SEROL controls the telescopes, you simply tell it what you’d like to observe and he will do all the hard work for you. This character appears throughout all of the Universe in the Classroom resources, watch out for it!